Algae Biofuel is being touted as an efficient, sustainable and renewable energy source for generations to come. Algae has more oil per pound compared to traditional biological sources such as corn and soybean. Since it can be cultivated in sewage water or saltwater, it does not compete with food crops in terms of land space or freshwater sources. Algae is also easy to cultivate. It can grow twenty to thirty times faster than traditional food crops with a harvesting cycle of one to ten days. This gives this alternative fuel source an almost abundant and continuous supply all year round. 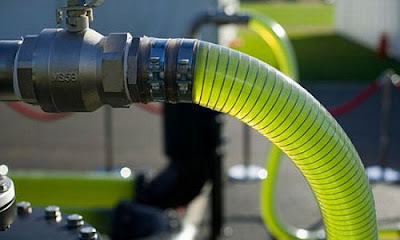 For examply, biodiesel is typically sourced from soybeans. With soybeans, the yield per acre per year is about 50 gallons. Comparing this to bio-oil that can be sourced from algae, the yield would be anywhere between 1,000 to 5,000 gallons per acre per year. The reason for this is because algae efficiently converts sunlight to biomass. Through chemical processes, oil can be extracted from this and converted to various oils and fuels that can even be used in combustible engines. Scientists today described an advance toward a long-sought economical process that could turn algae, like the stuff of pond scum, into a revolutionary new and sustainable source of biodiesel and other "green" fuels. 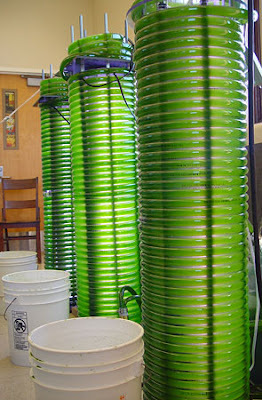 Their report on the use of an environmentally friendly process for extracting oil from algae came at a session of 16th annual Green Chemistry & Engineering Conference, being held here June 18-20 by the Green Chemistry Institute, part of the American Chemical Society (ACS), the world's largest scientific society. "Algae has great promise as a next-generation biofuel, a fuel that is sustainable and renewable," explained Julie Zimmerman, Ph.D., who leads the research team. "It has more oil per pound than corn and soybeans, does not divert crops from the food supply and can potentially be grown in sewage water and seawater without impacting the freshwater supply." The presentation was part of a symposium on green fuel sources, abstracts for which appear below. Lindsay Soh, a graduate student in Zimmerman's lab, described their efforts toward a simple process that would extract the fatty molecules called lipids used to make biodiesel from algae and transform them into usable fuel in one fell swoop. This could make biodiesel production from algae cheaper, faster and greener than current methods, which require separate steps — each with its own vessel and chemicals — to perform those operations. This "one-pot" reaction uses so-called supercritical carbon dioxide, which uses elevated pressures and temperatures so that it fills its container like a gas but is as dense as a liquid. Zimmerman pointed out that supercritical carbon dioxide has long had a variety of commercial and industrial uses, ranging from a process used to decaffeinate coffee to a more environmentally friendly solvent for dry cleaning clothing. The process is nontoxic, which makes it an attractive alternative to some of the harsher, potentially toxic chemicals used in other algae-to-biofuel technology, she noted. "But this really is the first time that scientists have realized that a green system like supercritical CO2 might have applications in producing biofuel from algae." Soh explained that similar approaches have been proposed for using supercritical methanol and ethanol, but the use of supercritical carbon dioxide requires lower temperatures, making it easier to work with and less energy-intensive. Another advantage, Zimmerman noted, is that the supercritical carbon dioxide, which acts as a solvent for oil, can be tuned to extract only specific components from algae oils, saving time and resources. Such tuning is not possible with conventional solvents. Another advantage: Supercritical carbon dioxide is a long-established technology, with an excellent track record in industrial and commercial applications ― something that may smooth its transition from the lab to everyday use. 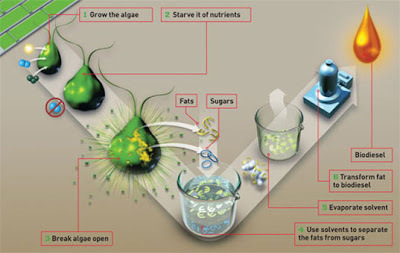 A peek at the algae biofuels production process. Zimmerman and Soh already have shown in previous research that supercritical carbon dioxide can extract lipids from algae. Soh now is moving ahead with the next step, which involves converting the lipids to biodiesel, with the ultimate goal of performing the entire extraction and conversion in a single production chamber. "Combining the processes into a single step is important," Soh explained. "Supercritical carbon dioxide is a pricey technology because it requires a good deal of energy and initial capital. If we can combine this into one step, it will reduce the costs and bring us closer to commercialization." Transforming the extracted lipids into biodiesel requires a catalyst, a substance that encourages a chemical reaction without being consumed by it. Soh is experimenting with several, focusing on commercially available catalysts that are insoluble in the supercritical carbon dioxide mixture so that they can be recovered after the reaction without additional steps, which take time, money and, frequently, potentially toxic chemicals.